Adaptable berlinese wall for RD52. 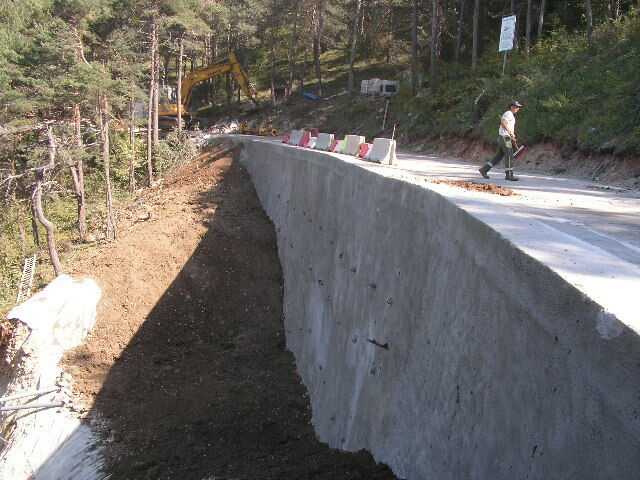 Faced with a risk of road collapse caused by a landslide on RD52 (Town of Brenon – Haut Var), the Conseil Général du Var, with the assistance of BET ERG – the very same team that undertook to restore trafficways in Dracénie,following the devastating floods of June 2010- has carried out specific reinforcement works. This made it possible to avoid resorting to the classic solution of building the road anew, an enterprise which proves both costly and time-consuming for a network operator. A 4-meter stock reserve for a ten-year respite "We were observing a sandy gully down RD52, which led to this portion of road being closed down. After investigations and in-depth geological and geotechnical surveys, we suggested that the Project Manager opt for structural reinforcement works which may take into account the evolutive nature of this landslide, a phenomenon that we believe is bound to expand in years to come," François Mailleux, CEO of ERG, explains. The undertaking was completed in the Spring and recently the road could reopen to traffic. 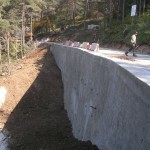 The work consists of a berlinese wall with passive anchors and a banquette – currently an 8-m retaining structure, to which a 4-m extention could be added in case the landslide worsened. To this aim 720 m of vertical piles (15 to 20 m long) were dug into the ground, excavation was carried out in successive operations from top to bottom and 4 rows of piles (total length: 844 m) were installed. The final touch was given with a drainage system and projected concrete sidings over welded wire mesh. The screen of piles makes it possible to anticipate the need for extending the sidings and the anchor lines in case of scouring at the base of the structure, or in case of lateral scouring. This 4-m reserve grants the road work a 10-year extension of its life span, which is quite an achievement on our limited budget," François Mayeux explained. The work was entrusted to MTPS, a Tarn-based company which undertakes specialized works. They found it necessary to use a drilling mast mounted on a hydraulic arm, capable of working from any angle. They also found it necessary to use extreme caution during the process, as the machine was installed just above the unstable area. des lignes d'ancrage supplémentaires et un parement étendu.